Do you know that your health is threatened every minute of the day, without you knowing it? In today’s generation where almost all electronic devices are already wireless— telecommunication, the Internet, and others— to make life easier and more convenient, you’d really not expect that threat is just around you and has been killing your health slowly. Especially the wifi in our telecommunicating devices, little do we know that those devices had been threatening our health massively than we thought. How can wifi devices threaten our health? Through the radiation it emits. It’s called wifi- radiation. Internet had a timid start in the 1960s as ARPANET. But now in the 21st century, the internet connects us all under a virtual roof and is navigating us towards a borderless world. The introduction of wireless internet, or WiFi, has meant that we can have a connection on-the-go instead of only connecting using a dial-up modem. In no time at all WiFi has taken the world by storm, and not surprisingly so. Surfing the internet from your sofa, from your bed, or even from your poolside chair is all possible thanks to WiFi devices. Modern day smartphones are owned by 68% of Americans and all smartphones come with a wireless function. But what exactly is WiFi? WiFi is a registered trademark owned by the WiFi Alliance, a nonprofit international association formed in 1999 to certify interoperability of wireless Local Area Network products (WLAN). WiFi does not use any wires − it uses radio frequency or microwave technology to transmit data through the air. WiFi radiation is more correctly termed RF (radio frequency) radiation because it operates within the range 3kHz-300GHz. That’s to say WiFi radiation is a type of electromagnetic field (EMF). We have long been told that the form of radio frequency radiation that WiFi devices utilize is non-ionizing. That is to say it doesn’t have sufficient energy to break the bonds that hold molecules together, and that there is no heating effect… so therefore it is harmless. Or at least that’s what we’re told. But thousands of peer reviewed studies now tell a different story. WiFi radiation may not cause a thermal heating effect, and it might be non-ionizing − but it is far from harmless. In my home and work environment I long ago made the decision to completely steer clear of WiFi. You might not feel you want to go “the whole nine yards” on this. Here are some ways you can reduce the burden of radio frequency radiation from WiFi on your body. 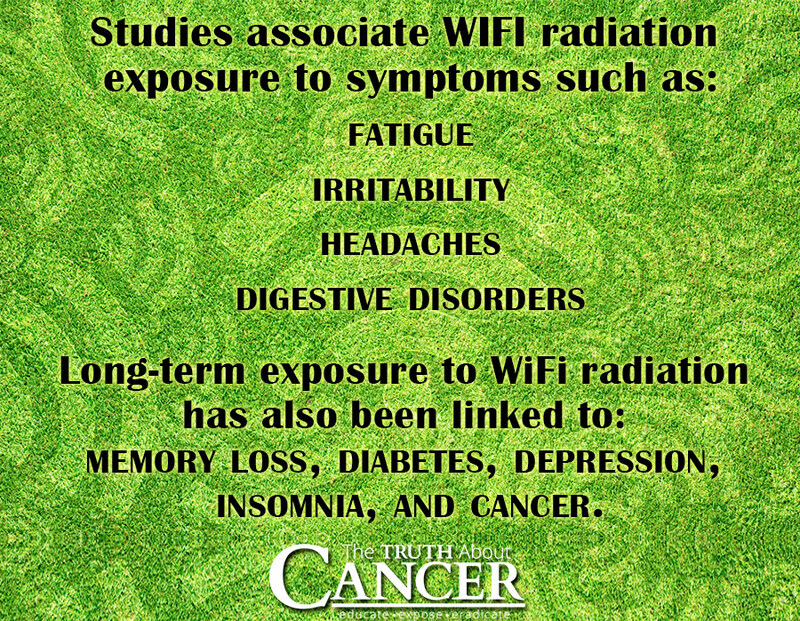 You can pick and choose from this list according to how much you want to reduce WiFi radiation exposure in your life. Avoid using WiFi while you’re in a vehicle as the frequencies end up being bounced around, thus increasing your exposure. Turn off your WiFi when you’re not using the internet and especially when you go to sleep at night. Your body goes into repair-mode during sleep and radio frequency interference at this time slows down your body’s healing process. Choose to use a hardwired Ethernet connection in your home instead of wireless. If you do decide to keep your wireless modem/router, situate it as far as possible from your bedroom and as far as possible from rooms where you spend a lot of time. Be mindful of WiFi radiation exposure from neighbors. After first measuring these exposures with a radio frequency meter, you can install shielding materials to block out WiFi signals. Note: other wireless devices such as Bluetooth headsets, cordless phones, smart TVs, and smartwatches also emit radio frequency radiation – the dangers of these devices are the same as for WiFi. The Ontario (Canada) Agency for Health Protection and Promotion carried out a research program lead by Dr. Magda Havas. They identified that younger children exposed to long-term radio frequency have lower oxygen absorption and lower carbon dioxide being produced. Act now to protect you and your children from WiFi radiation exposure; it’s best to be safe than sorry when it comes to our health and that of our loved ones. Please help raise awareness of the potential damaging effects of Wifi by sharing this article with your friends and family.